The Polycom Hands-Free Pouch has been discontinued. No direct replacement is available. 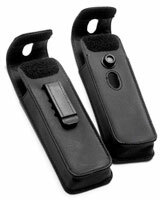 Nylon holster with metal belt clip designed specifically for hands-free use with headset. Wireless Telephone is securely held upside-down to facilitate viewing display and keypad.